What is third party fire and theft and what does it cover? For the most part, third party fire and theft car insurance is the same as third party only. 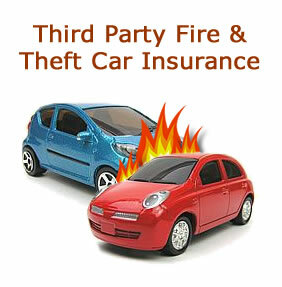 As with third party insurance, third party fire and theft (TPFT) covers mainly the third party. Defined as the first party being the purchasing policyholder, second party being the car insurance company and the third party being the individual or individuals who make a claim against your insurance due to an accident that was your fault. Third party fire and theft was often the preferred car insurance policy type for new and young drivers who wanted the cheap option of third party insurance, but with extra cover that protects their car from fire and theft. The table below details the basic coverage of third party fire and theft car insurance. Certain car insurance companies may offer extras or add-ons on top of the basic coverage listed. third party fire and theft, is it worth it? Whether opting for third party car insurance only or third party fire and theft is dependent on the value of your vehicle. With third party and TPFT insurance your car will not be covered if involved in an accident, however if your car is stolen, you can claim for this on TPFT plus any damage acquired as a result of its theft. TPFT will also cover your vehicle if it is involved in a fire whether accidental or intentional. If your car is valued at £2000 or over, or may be considered attractive to thieves, third party fire and theft or comprehensive insurance would be the sensible option. Due to accident statistics being high for young drivers, as with third party only, insurance companies have also significantly increased the price of TPFT insurance to deter young drivers from taking a policy and to reclaim monies lost for those that can afford it. If your car is of little value, third party or third party fire and theft car insurance would seem like the sensible option. Don’t assume however that both of these insurance types will be cheaper than fully comprehensive as due to the increase in basic insurance premiums, fully comprehensive can often work out cheaper. Get as many quotes as possible for all car insurance types. There is no excess to pay on third party only car insurance as your vehicle is not covered in any way. There will often be third party fire and theft excess which is compulsory due to the cover in the event of fire, fire damage, theft or theft damage. A method for getting cheaper third party fire and theft insurance is to increase the excess. The amount of excess is usually optional from a set compulsory minimum to a maximum set by the provider. In the event of fire, theft or damage caused by either, the excess you agree to pay will be taken from any payment issued by the insurance provider. Below is advice on finding cheap third party fire and theft car insurance quotes. Choose your vehicle carefully Car insurance groups range from 1 to 50. Group 1 being cheapest. Group 1 type vehicles are often small in size with small engines such as the Vauxhall Corsa 1.0i 12V Expression 3d (2006 onwards) or a Citroën 1.0i Vibe 3d. See Best Cars for Young and New Drivers for a list of the cheapest cars to insure. Obtain quotes on all insurance Many new or young drivers opt for third party fire and theft insurance believing it is the cheapest. Whilst searching for quotes, obtain quotes for all insurance types including fully comprehensive as it may be cheaper. Keep mileage to a minimum The less miles you drive the less likely you are of having an accident, therefore fewer mile means cheaper insurance. Additional driver New or young drivers may benefit from adding an extra driver to their policy such as a parent and may reduce the costs of your third party fire and theft policy. Vehicle modifications Any vehicle modification outside of standard factory defaults may increase insurance premiums as these may increase performance or may make the vehicle more desirable to thieves. Increase voluntary excess Third party fire and theft insurance will usually have a compulsory excess. You should have an option whilst obtaining quotes on how much you wish to pay depending on the vehicle. The higher the excess you agree to pay, the cheaper your quote. Overnight off-road parking Parking our car off the road, especially in a garage reduces the possibility of damage or theft and will help to reduce your premium. Fit security devices Fitting your car with an alarm, immobiliser or tracker will reduce the chance of it being broken into or stolen and as a result will provide you with a cheaper quote. It’s often thought that driving another vehicle under your own insurance policy requires fully comprehensive insurance, some providers do cover you to drive another car from a third party fire and theft policy. This is however an extension only found on certain third party fire and theft policies and should not be assumed. If it is your intention to drive another vehicle other than your own under a third party fire and theft policy, you must stipulate your requirements before taking out a policy or if you are already held in a policy check with your provider to ensure you are covered. Such details will also be explained on your certificate of motor insurance. If your policy does allow you to drive other cars, you will only be covered to drive that vehicle under third party only.